Last year, DePauw University head baseball coach Blake Allen traveled to Zionsville High School to meet with some of the baseball players. Zionsville was coming off their third straight sectional championship and had talented players interested in DePauw. That visit may have turned out to be a bigger deal than expected. Nick Nelson and Kyle Callahan, two of the players Allen met with that day, were impressed with the pitch he gave them. Callahan and Nelson had been best friends since the beginning of high school and had played baseball together for even longer, so their college decision wasn’t necessarily an individual effort. They talked about it, and weighed the pros and cons of each school on their radars, most of which were the same. After careful consideration, Nelson made his commitment to play baseball at DePauw, and after just a couple of days of persuasion from Nelson, Callahan followed suit. The two would travel to Greencastle the next year to play baseball together, room together and continue a friendship that is close to a decade long on and off the field. Nelson and Callahan grew up in Zionsville, Indiana, a northwest Indianapolis suburb. The two first met when they played travel baseball together for the Zionsville Baseball Club. Since they grew up on different sides of town, they never attended the same school until high school. Callahan recalls the very first day of high school and sitting at the same lunch table as Nelson. They point it out as a time that may have sparked their friendship. It’s funny because sitting at the same lunch table seems so juvenile for their friendship. There have been so many moments along the path leading them from teammates to kids who sat at the same lunch table, to friends and finally, to what is more like family. There’s the baseball side of their lives—fighting through sectionals for three straight times, only to fall short of a state championship each time in heartbreaking losses. First, in the state championship as sophomores. Then, semi state as juniors. And finally, a regional loss senior year to Fishers High School, the eventual state champions. “Brutal,” Nelson said, speaking about the loss to Fishers. Then, there’s the football side of their lives, with Nelson playing all four years as a running back and safety for Zionsville. Every day Nelson would try to convince Callahan to join the team, and after two years of persistent effort, Callahan joined the football team as a junior. Callahan also played running back, so when it was time for Nelson to practice at safety, he was going up against Callahan. This meant often times tackling him and competing against him. And there’s the off-the-field friendship, with the memories they’ve made along the way at each other’s houses playing video games and watching sports. Nelson said that one of his favorite memories was of one summer in high school when he and Callahan decided to take a spontaneous trip to Chicago to see a Cubs game, only to find out that the game was nearly sold out when they got to the ticket counter. Since there were no pairs of seats next to each other available, they had to sit across the stadium from each other. All of these things made being roommates in college such an easy decision. They agreed that they hardly had to have a discussion about it; they just knew they would live together. Being roommates has made their lives easier. They know what they want from each other. They have the same schedules. And they are both driven. Nelson is looking to study kinesiology, while Callahan is going to major in biology on the pre-med path. They have known each other’s goals and aspirations for years, and keeping each other’s priorities in line is part of their friendship. “It’s nice to have a best friend that is on the same page as you academically, and we know what needs to come first in our lives,” Callahan said. One of the many components that makes Nelson and Callahan unique is their impact on the baseball team as first-years. They have both been consistent starters all year, Nelson in centerfield and Callahan in leftfield or first base. Callahan leads the team in onbase percentage at .514, and Nelson is tied with another team member for the most home runs at two. 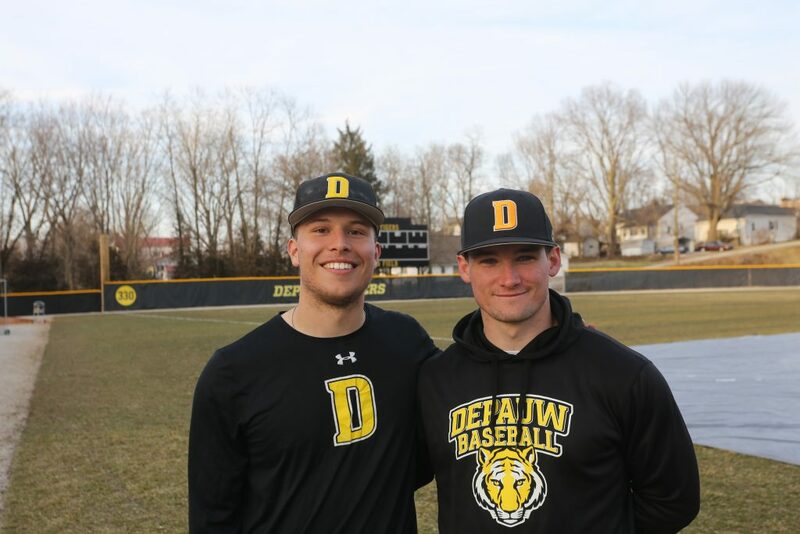 It is not very common for two first-years to start on a competitive baseball team like DePauw has this year, let alone be two of the best players and best friends for most of their lives. The DePauw baseball team has five more wins than they did at this time last year, and they look to be real competitors in the North Coast Athletic Conference. Yet, seniors Noah Salasky and Nolan Lavender are the only seniors who consistently hit in the lineup, and senior Grant Rademacher is the only senior pitcher who has pitched more than six innings this season. The team is driven by underclassmen at all levels, and Nelson and Callahan are part of that movement. It’s just a little different for them. Winning games and glancing over their shoulders to a lifelong best friend, knowing they have played together for so long, and knowing they still have so much ahead of them. “It’s like we brought a little bit of Zionsville, a little bit of our childhoods, to DePauw,” Nelson said.